Leading Manufacturer of cha software, custom house agent software and cha erp software from Ahmedabad. Cha365cloud - is an ERP module with a specific feature of customs management in addition to other features. Cha365cloud - Web & Mobile application simplifies your business day to day transaction. One of the most crucial part of logistics is handled by Customs House Agent/ Customs Broker or an importer/ exporter. Cha365cloud is the lading Customs clearing software in India. It will be lead in simplifying the operations of custom clearance. 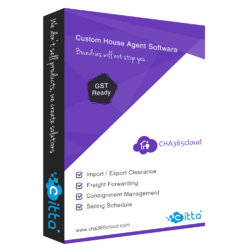 A web based, on demand CHA ERP Software for CHA / Customs Brokers Cha365cloud helps to manage complete customs clearance process in India. Cha365cloud automates entire customs clearing operations including Document Creation, Online Document Filing, Customs Compliance and many more.